” The centre’s accreditation this week with the National Health and Medical Research Council proved the “landmark research” by consortium members had “huge potential” to address serious indigenous health issues. An academic health science centre in Central Australia is the first Aboriginal-led collaboration to achieve Federal Government recognition for leadership in health research and delivery of evidence-based health care. The Federal Minister for Indigenous Health and Aged Care, the Hon Ken Wyatt MP, today announced that the Central Australia Academic Health Science Centre (CAAHSC) was one of only two consortia nationally to be recognised as a Centre for Innovation in Regional Health (CIRH) by Australia’s peak funding body for medical research, the National Health and Medical Research Council (NHMRC). To be successful in their bid, the 11-member consortium was required to demonstrate competitiveness at the highest international levels across all relevant areas of health research and translation of research findings into health care practice. Sydney and Adelaide. The CAAHSC is also in good company internationally, with long established collaborations including Imperial College Healthcare in the UK and Johns Hopkins Medicine in the USA. 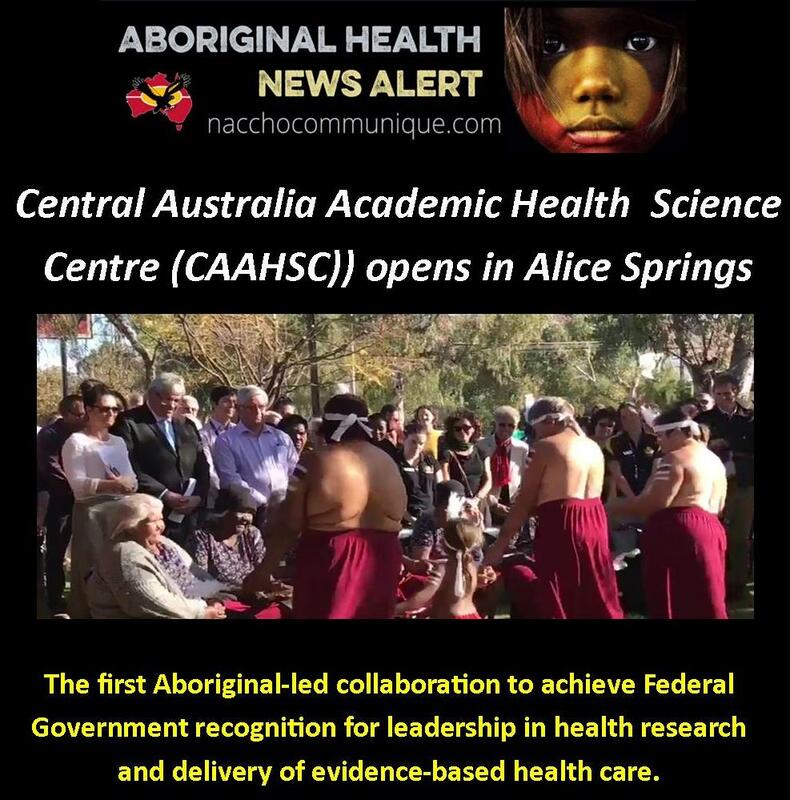 The CAAHSC, whose membership includes Aboriginal community controlled and government-run health services, universities and medical research institutes, was formally established in 2014 to improve collaboration across the sectors in support of health. 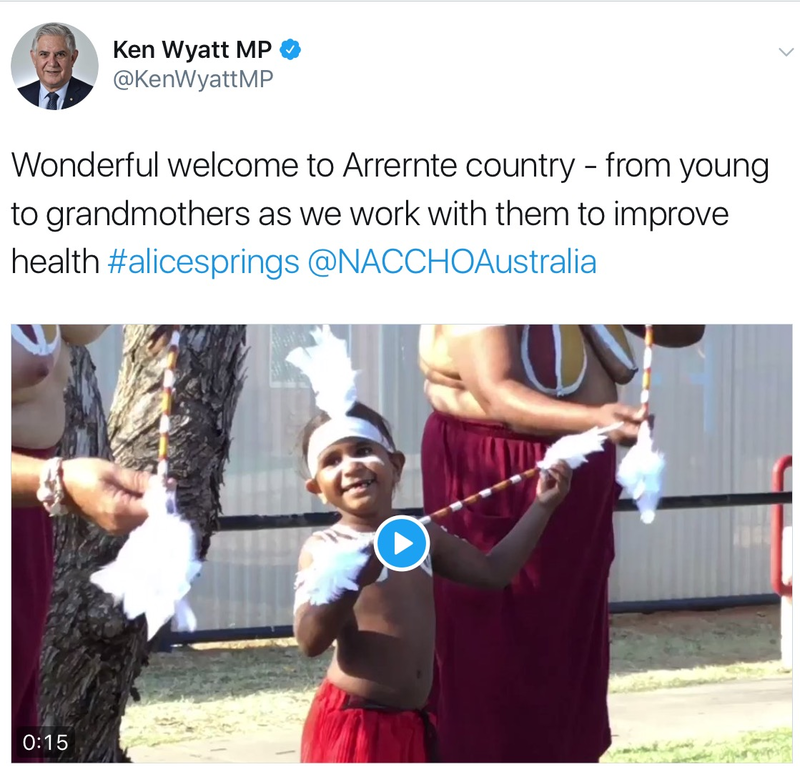 Such synergy is vital in order to make an impact in remote central Australia, considering the vast geographical area (over 1 million square kilometres) and the health challenges experienced particularly by Aboriginal residents. The CAAHSC consortium reflects the importance of Aboriginal leadership in successful research and health improvement in Central Australia. The Chairperson of CAAHSC is Mr John Paterson, CEO of the Aboriginal Medical Services Alliance Northern Territory, the peak body for the Aboriginal community controlled health services sector in the NT. With the leadership of CEO Ms Donna Ah Chee, Central Australian Aboriginal Congress was the lead partner on the group’s bid to become a CIRH. The CAAHSC is a community driven partnership, where Aboriginal people themselves have taken the lead in identifying and defining viable solutions for the health inequities experienced in the Central Australia region. The CAAHSC partners have a long and successful track record of working together on innovative, evidence-based projects to improve health care policy and practice in the region. Such projects include a study that examined high rates of self-discharge by Aboriginal patients at the Alice Springs Hospital, which in many cases can lead to poor health outcomes. This research was used to develop a tool to assess self-discharge risk which is now routinely used in care, and to expand the role of Aboriginal Liaison Officers within the hospital. Northern Territory to improve antenatal care in the Aboriginal population. CAAHSC Chair, Mr John Paterson agrees, saying the CIRH would serve as a model for other regional and remote areas both nationally and internationally, particularly in its governance, capacity building, and culturally appropriate approaches to translational research. Mr Paterson said he hoped NHMRC recognition would attract greater numbers of highly skilled researchers and health professionals to work in Central Australia, and that local Aboriginal people would become more engaged in medical education, research and health care delivery. He also hopes that achieving status as a CIRH will be instrumental in attracting further resources to the region, including government, corporate and philanthropic support. Mr Paterson said the consortium is now focussed on building a plan across its five priority areas: workforce and capacity building; policy research and evaluation; health services research; health determinants and risk factors; and chronic and communicable disease. This will include development of research support ‘apprenticeships’ for Aboriginal people and pursuit of long-term financial sustainability. The partners of the Central Australia Academic Health Science Centre include: Aboriginal Medical Services Alliance Northern Territory (AMSANT); Baker Heart and Diabetes Institute; Charles Darwin University; Centre for Remote Health (A joint centre of Flinders University and Charles Darwin University); Central Australian Aboriginal Congress; Menzies School of Health Research; Central Australia Health Service (Northern Territory Health); CRANAplus; Flinders University; Ngaanyatjarra Health Service and the Poche Centre for Indigenous Health and Wellbeing. Chronic diseases are the most important contributor to the life expectancy gap between Indigenous and non-Indigenous Australians. Given their impact on premature mortality, disability and health care utilisation in Central Australia it is unsurprising that chronic disease has become the primary focus for addressing Indigenous Australian health disadvantage. The Central Australia AHSC has considerable research and translation expertise with those chronic conditions that most impact the Aboriginal Australian population, including diabetes, heart disease, renal disease and depression. Some of our focus areas are: understanding the developmental origins of adult chronic disease through targeted multi-disciplinary research focused on in-utero, maternal and early life determinants; understanding and preventing the early onset and rapid progression of heart, lung and kidney disease and diabetes within Aboriginal people, and developing and supporting capacity development of the chronic disease workforce within Aboriginal communities and health services. In order to support the health of Central Australians, we recognise the importance of transcending boundaries between the biological, social and clinical sciences. The Central Australia AHSC takes an interdisciplinary approach to understanding social gradients, their determinants, and pathways by which these determinants contribute to illness, and consequently to forwarding policy responses to reduce health inequalities. The Central Australia AHSC is interested in exploring the role of stress, intergenerational trauma and other psychosocial factors, as well as uncovering the biological pathways by which social factors impact on cardiometabolic risk, mental illness and other conditions of relevance to Indigenous communities. As a regional hub servicing a high proportion of Aboriginal people spread across an extensive area, Central Australia serves as an exemplar environment through which to address critical issues of national importance – for instance, targeted and practical research focused on the National Health and Hospital Reform agenda, the ‘Close the Gap’ reforms and the Indigenous Advancement Strategy. Through health services research, the Central Australia AHSC is chiefly interested in developing and equipping primary care and hospital services with the skills, methods and tools by which to improve health care quality, appropriateness and accessibility. The Central Australia AHSC brings together the expertise of leading clinician researchers, public health specialists and health service decision makers. The Central Australia AHSC provides the capacity to evaluate the systems that underpin change management in health care through policy, protocol and evaluation research, and to support quality improvement processes through health provider training. While being locally relevant, our works also informs jurisdictional and national health policy and practice in Aboriginal and remote health and implementation of national health reforms. Central Australia’s health care workforce encompasses health care providers in hospitals, remote Aboriginal communities, and outreach services, including Aboriginal health practitioners, nurses, allied health providers, general practitioners and specialists. Remoteness and the challenging work environment often translate to high levels of health provider staff turnover. The Central Australia AHSC’s ongoing focus on professional development and capacity building facilitates health work force sustainability by providing relevant training and support and by attracting new health care providers who are also involved in research. Workforce and capacity building undertaken by the AHSC partners includes the delivery of education programs (including tailored remote and Indigenous health postgraduate awards for doctors, nurses and allied health practitioners), growing research capacity (supervised formal academic qualifications and informal mentoring), and conducting research to inform workforce recruitment and retention. 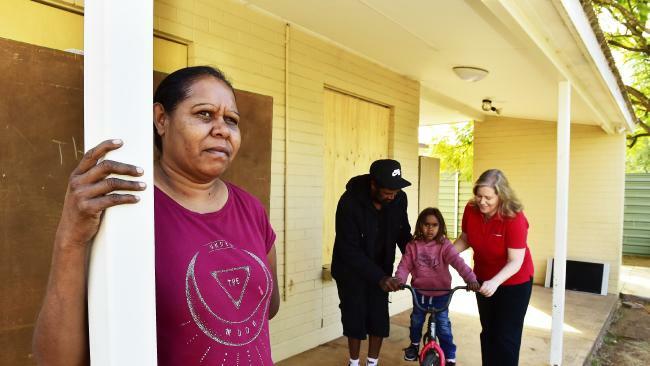 Alice Springs mother Nellie Impu is part of a grim health statistic profoundly out of place in a first-world nation: one in five pregnant Aboriginal women in the Northern Territory has diabetes. For pre-existing type 2 diabetes, that’s at a rate 10 times higher than for non-indigenous women; more common gestational diabetes is 1.5 times the rate. Mrs Impu became part of that statistic almost five years ago when she was pregnant with son Wayne. So the announcement of a new central Australian academic health science centre, led by the Aboriginal community-controlled health service sector and bringing together a consortium of 11 clinical and research groups, is a big deal for her and many women like her. The diabetes treatment she underwent while carrying Wayne will continue for more than a decade as part of a longitudinal study. “We know there is a link ­between mums with diabetes in pregnancy and outcomes for their babies as they grow, including ­future possibilities of type 2 diabetes, which work like this can help us track,” said research nurse Paula Van Dokkum, who works with consortium member Baker IDI Heart and Diabetes Institute. Wayne is meeting all his childhood development targets, and his mother said the ongoing association with the centre would help her in “trying to make sure he grows up healthy and strong”. 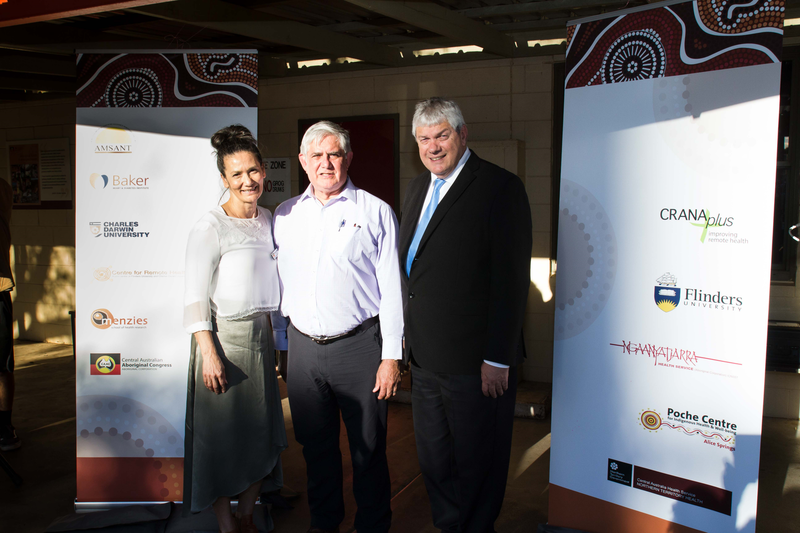 Announcing $222,000 in seed funding, federal Indigenous Health Minister Ken Wyatt said the centre’s accreditation this week with the National Health and Medical Research Council proved the “landmark research” by consortium members had “huge potential” to address serious indigenous health issues. “The objective is to evaluate problems and find practical solutions fast, to prevent health problems and give speedy but lasting benefits to patients within community,” Mr Wyatt said. The academic health science centre model, well ­established internationally, brings together health services, universities and medical research institutes to better produce evidence-based care. The Alice Springs-based enterprise will aim to tackle a ­cancer-causing virus endemic in indigenous central Australia, its only significant instance outside South America and central Africa. The human T-lymphotropic virus type 1 causes a slow death over 20 years with leukaemia, chronic cough, respiratory problems and respiratory failure. It can be acquired through breast milk in early childhood as well as through blood or sexual contact. A recent study found HTLV-1 infection rates in a central Australian indigenous community of more than 40 per cent. One result, the inflammatory disease bronch­iectasis, is a leading cause of death for young adults at the Alice Springs hospital. The program will also address the soaring demand for dialysis in remote communities, with indigenous Australians five times as likely to have end-stage kidney disease than other Australians. Alice Springs hospital is home to the largest single-standing ­dialysis service in the southern hemisphere, with 360 patients. London, Boston, Toronto, Melbourne … and Alice Springs. Although there may be little in common between these major cities and the heart of Australia’s outback, an announcement this week brings the Red Centre into the company of international players in translational health research, including prestigious institutions such as Imperial College Healthcare in Britain and Johns Hopkins Medicine in the US. This week, the Central Australia Academic Health Science Centre was given the official seal of approval by the National Health and Medical Research Council. The Central Australia consortium was one of only two centres recognised as a centre of innovation in regional health for its leadership in health research and delivery of evidence-based healthcare. And now there’s opportunity in the Red Centre to do even more. It may well be the most remote academic health science centre in the world, and perhaps the only academic health science centre in the world led by Aboriginal people. With such esteemed recognition for this remote, Aboriginal-led, evidence-based healthcare collaboration, it is hoped that public and private support will also follow. As a model well established abroad and gaining momentum in Australia, academic health science centres are partnerships between health services, universities and medical research institutes whose collaborative work ensures that translational health research leads to evidence-based care and better health outcomes for patients. For the 11 partners behind the Central Australia partnership, recognition as a centre for innovation in regional health acknowledges the outstanding collaboration that has existed in this region for several years, and particularly the leadership offered by the Aboriginal sector. Working with the other partners in the consortium, Aboriginal community-controlled health services are taking the lead in identifying and defining viable solutions for the health inequities experienced in the region. The work of the Central Australia partners is practical and responsive. Interested in resolving what had become a troubling issue at Alice Springs Hospital, a resident physician researcher initiated a study that found nearly half of all admitted Aboriginal patients had self-discharged from the hospital in the past, with physician, hospital and patient factors contributing to this practice. The research findings were used to develop a self-discharge risk assessment tool that is now routinely used in hospital care, and to expand the role of Aboriginal liaison officers within the hospital. Considering the vast and remote geographical area — more than one million square kilometres — and the health challenges experienced particularly by Aboriginal residents who make up about 45 per cent of the region’s population of about 55,000 people, the Central Australia consortium faces unique and significant challenges. In this respect, Alice Springs may be more like Iqaluit in the Canadian Arctic than London or Baltimore. But in other ways this relatively small academic health science centre may be at an advantage. With its closely knit network of healthcare providers, medical researchers, medical education providers and public health experts working together, community-driven approaches to identifying issues and developing evidence-based solutions have become a standard approach in Central Australia. In this setting of high need and limited resources, working collectively is sensible, practical and necessary. Importantly, there is the possibility to do a lot more. The consortium hopes such recognition will help to attract top healthcare providers and researchers, to increase educational offerings and to develop local talent, especially Aboriginal people. The evidence is resounding. A research oasis in the desert, this centre for innovation is fertile ground for investment by government, corporations and philanthropists alike. 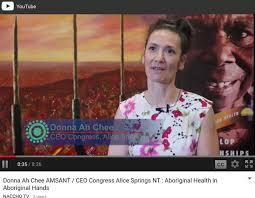 Donna Ah Chee is chief executive of the Central Australian Aboriginal Congress. John Paterson is chief executive of the Aboriginal Medical Services Alliance Northern Territory.